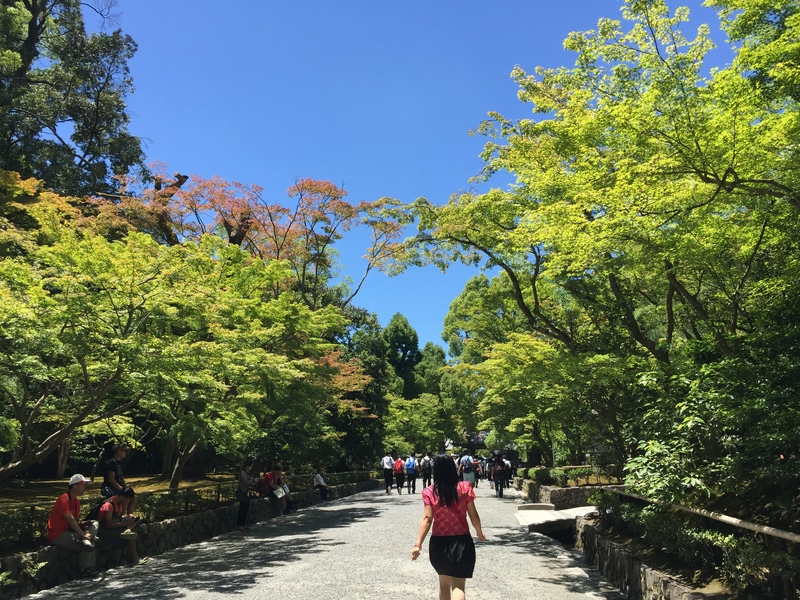 Our last day in Kyoto was a perfect weather day–clear blue skies, gentle breeze, perfect temperatures… We had spent the previous day hitting all of the shops in the city, so we decided that our last day should be spent enjoying nature. 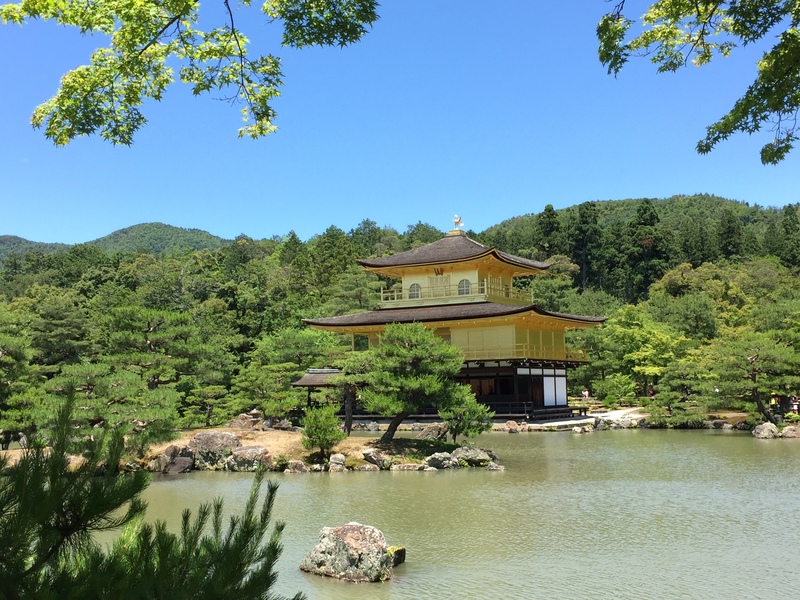 A trip to Kinkaku-ji, the Golden Pavillion and Sagano Bamboo Grove was the perfect way to pass the day. This area of Kyoto was a bit farther away from most of the other things we did in Kyoto, almost an hour on bus and train. 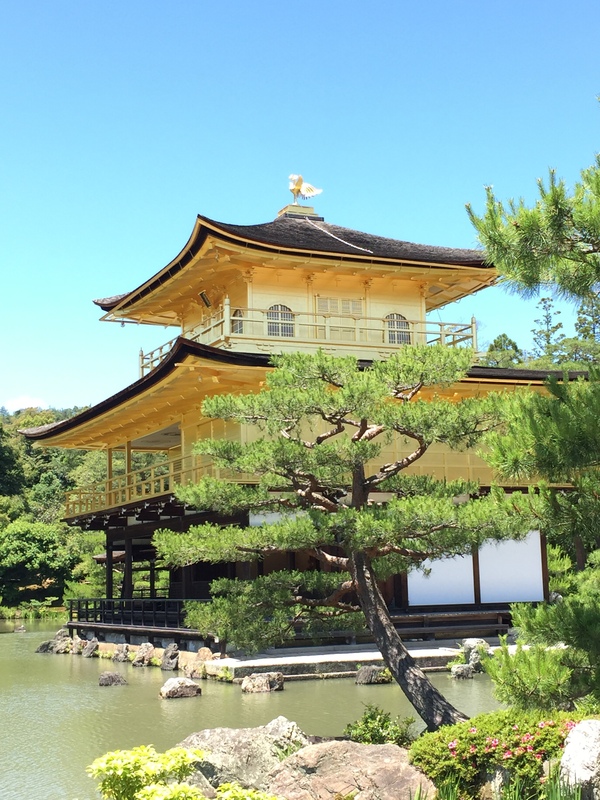 The Golden Pavilion is a Zen Buddhist Temple founded in 1397, though the structure was rebuilt in 1955 after the original was burned down by an arsonist in 1950. The top two floors are adorned with gold leaf and my pictures do not do justice to the building’s golden brilliance, especially in the sun. 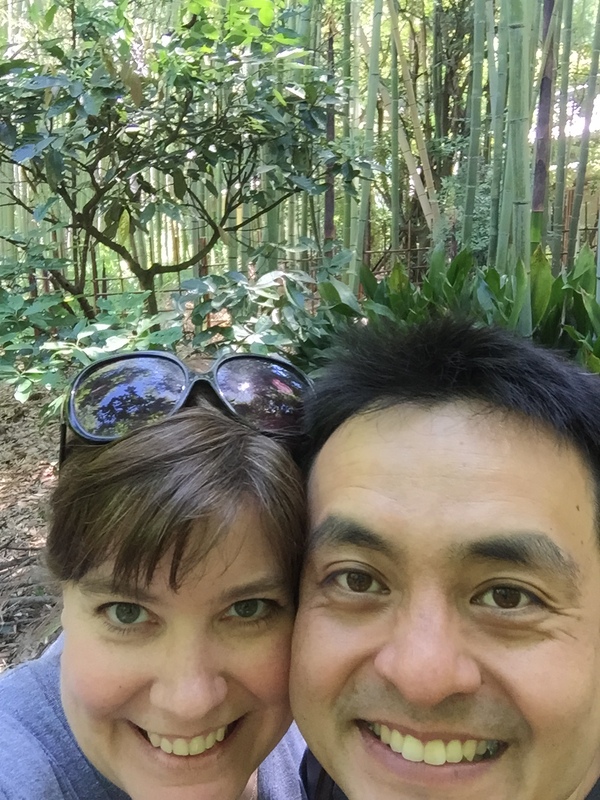 It is one of the most popular things to see in Kyoto and trust me…it was selfie stick mayhem when we visited. As you walk to the viewing area (you can’t go inside the pavilion and can only see it from across the water), the area is pretty calm, but the viewing area is a crazy frenzy of picture taking and shoving and chatter in every language imaginable. You have to be super-patient and a little aggressive to get a good shot. Naoto and I were feeling very zen and didn’t want to fight the crowds so we decided to take a selfie on one of the paths leading away from the pavilion. This was the best picture we could take without a selfie stick…you can barely see the pavilion beyond Naoto’s shoulder. 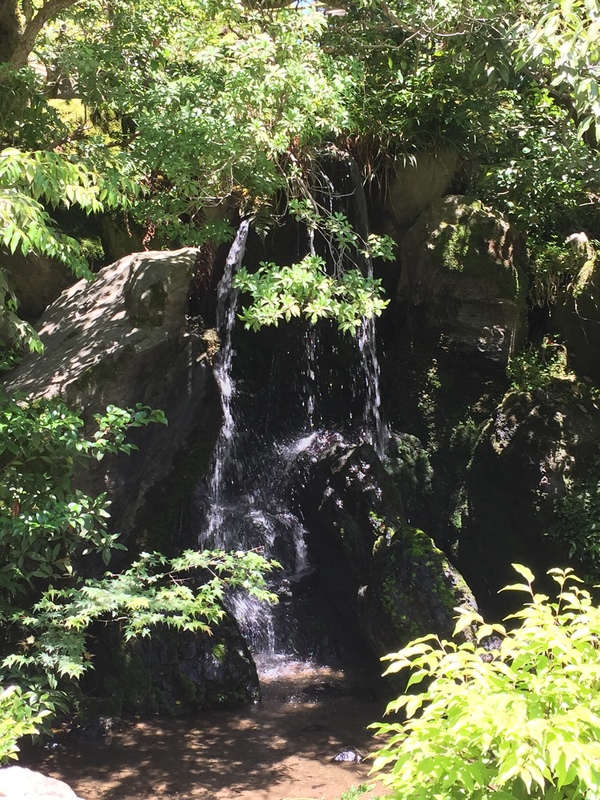 We spent a little bit of time in the area surrounding the pavilion, enjoying the tiny waterfalls and the extremely blue skies. Before we moved on to the bamboo forest, we enjoyed some green tea soft serve (Naoto got golden sprinkles on his) to cool off and get ready for another walk. To get to the Arashiyama Bamboo Grove, you have to take a charming, old-fashioned train. Once you get off, there are tons of little souvenir and snack shops in the station area before you venture out to the forest. It’s very bustling and touristy, but retains some of the charm of old Japan. 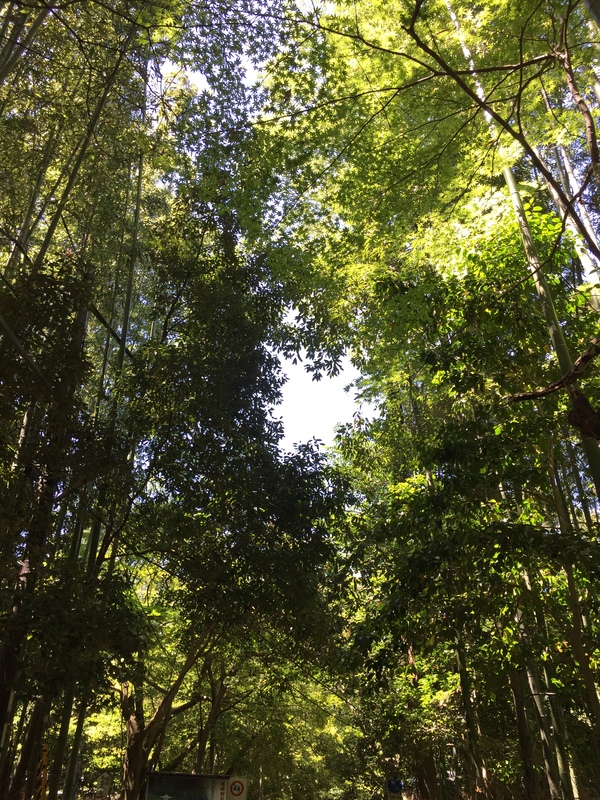 The bamboo forest was heavenly. The first time I went in December of 2008, I don’t remember it feeling so relaxing. 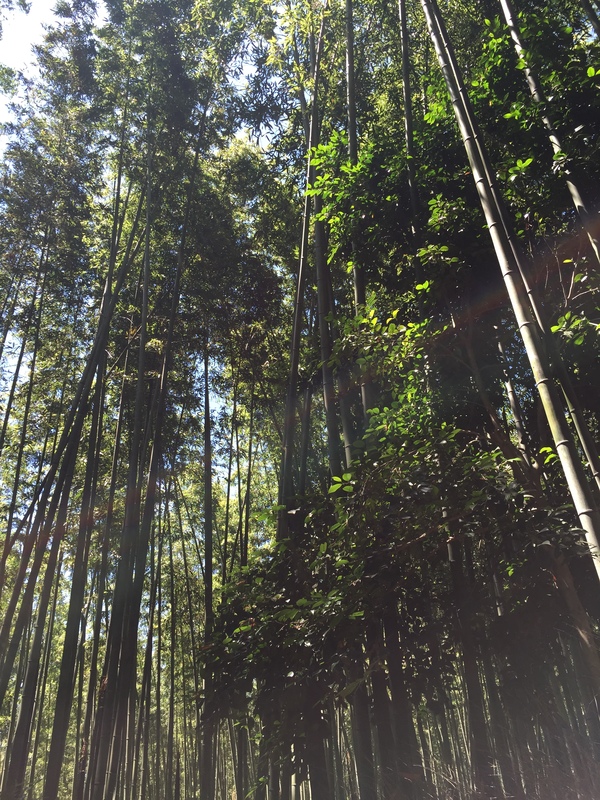 But the tall bamboo blocked out the sun and provided a little respite in the warm afternoon. It was neat to see the new bamboo poking through the ground. And because there was a gentle breeze, we were lulled into relaxation by the sounds of the bamboo swaying in the wind. The video above will give you a little taste of the sounds (until the railroad crossing gates interrupt our zen moment at the end!) 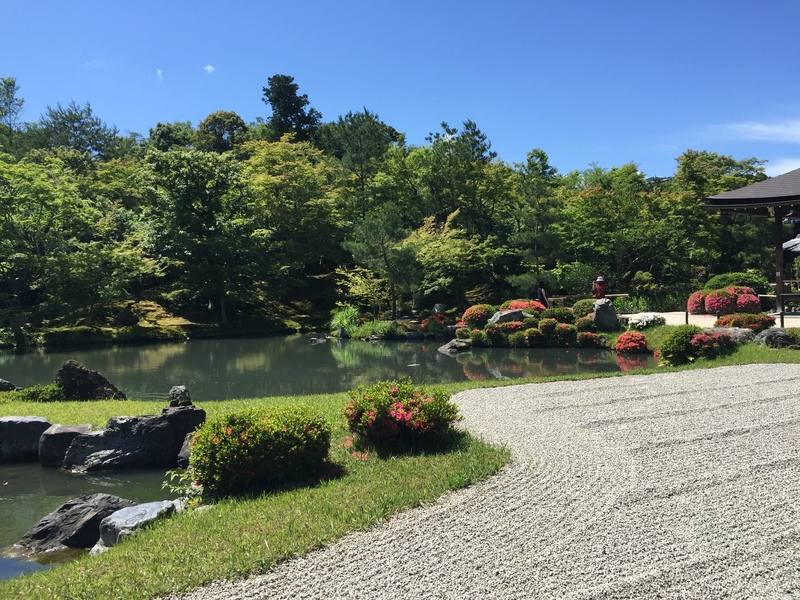 After the bamboo forest, we walked around the little shops and ended up going to Tenryuji Temple to walk around the surrounding gardens. There was a small zen garden, but we mostly enjoyed the stroll up the hill through all of the flowers and the views of the treetops. It really was the perfect way to end our trip to Kyoto. After this we hopped back on a shinkansen and went back to Tokyo. 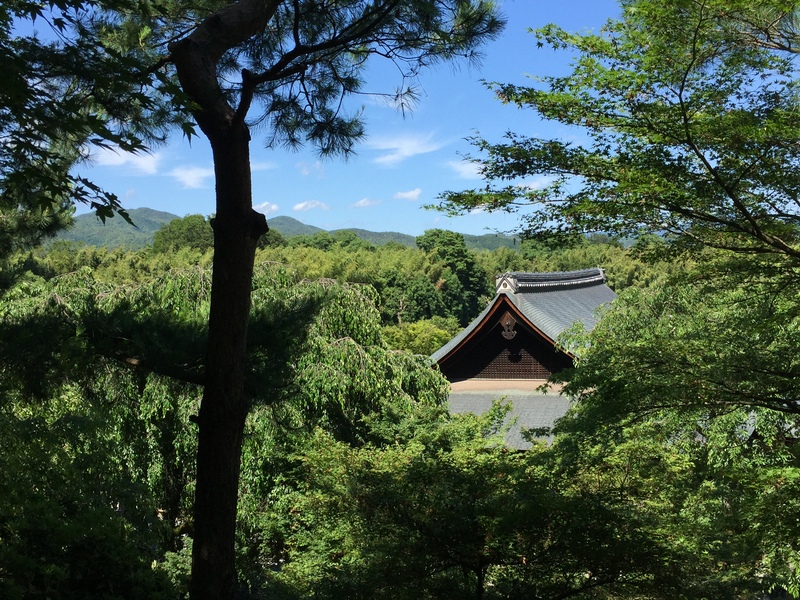 But I’m not finished blogging about Kyoto! I still need to share a couple of great shops and restaurants we visited! Soon! The weather has been so nice around here lately that it’s hard to be inside blogging when I could be outside enjoying the last days of summer! I have to say I enjoyed Kyoto more than I thought I would! Definitely do not mind going back there!